A Bill of Sale, similar to a Sales Agreement, is used to document that a buyer has bought and paid for one or more specific items (worth more than $500) (e.g. car, animal, electronics) from the seller and is entitled to ownership of the item(s). In addition, the time and place of the purchase, purchase price, method of payment, and other related details are also included. Depending on your jurisdiction, a Bill of Sale may be required as a condition of transferring title to the buyer. A Bill of Sale CANNOT be used to buy or sell real estate. Do you wish to add a more detailed description of the Aircraft features? E.g. A 12 Amp electric reciprocating saw is being sold. E.g. A teak dining table with four chairs is being sold. Are you selling more than one animal? E.g. Two golden retriever puppies are being sold. E.g. One Monet oil painting is being sold. Do you wish to add a more detailed description of the Electronics? Do you wish to add a more detailed description of the Appliance? Do you wish to add a more detailed description of the Firearms? Do you wish to add a more detailed description of the Vehicle's features? What is the current odometer reading? Is this number in miles or kilometers? Is the current odometer reading accurate? Has the odometer been altered or repaired while in your possession? What was the odometer reading before zeroing? Do you wish to add a more detailed description of the Water Craft's features? Do you wish to promise that you are the legal owner(s) of the Aircraft? Do you wish to promise that you are the legal owner(s) of the Appliance? Do you wish to promise that you are the legal owner(s) of the Electronics? Do you wish to promise that you are the legal owner(s) of the Firearms? Do you wish to promise that you are the legal owner(s) of the Furniture? Do you wish to promise that you are the legal owner(s) of the Motor Vehicle? Do you wish to promise that you are the legal owner(s) of the Power Tool? Do you wish to promise that you are the legal owner(s) of the Water Craft? Do you wish to promise that you are the legal owner(s) of the property? Are there any loans or claims against the Aircraft? Are there any loans or claims against the Appliance? Are there any loans or claims against the Electronics? Are there any loans or claims against the Firearms? Are there any loans or claims against the Furniture? Are there any loans or claims against the Motor Vehicle? Are there any loans or claims against the Water Craft? Are there any loans or claims against the Power Tool? Are there any loans or claims against the property? E.g. A $500 lien has been registered against the lawnmower by Richard Smith of 123 Oak St., Birmingham, Alabama. Will the loans and/or claims be resolved in the near future? Loans and/or claims will be resolved within how many days? Do you wish to warrant that the Water Craft will be free of mechanical defects for a specified period? How many days will the mechanical warranty last? To ensure the validity of this Bill of Sale, we recommend getting it signed by one or more witnesses and a notary public. If a notary public will be present, you will be able to choose between a signature and a notarial acknowledgement. In most cases, a signature is sufficient. If you are unsure about your specific requirements, remember that it is better to go beyond what is needed than to find out later that important information is missing. Will the notary be giving a notarial acknowledgement? We strongly recommend obtaining an attorney reviewed Bill of Sale directly from us. The Purchase Price is the sum of ________ which was received in full by the Seller. The Seller guarantees that they are the true and lawful owner of the above-described vehicle and that it is free and clear of all encumbrances, liens and any and all legal claims. The Seller warrants that at the date of execution of this agreement there are no licensing fees or fines or other penalties outstanding against the registration of the above-mentioned vehicle. 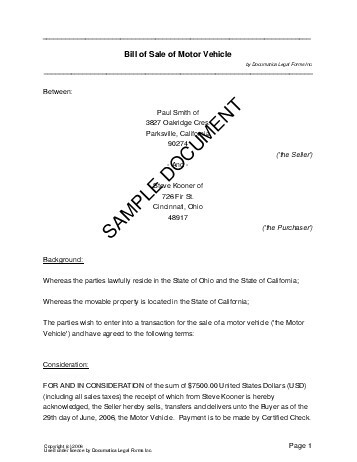 The vehicle is sold "As-Is" and the seller shall not be liable for any defects whatsoever. The Buyer admits having inspected the vehicle to his/her satisfaction and that no guarantees or warranties of any nature were expressed or implied by the Seller regarding the condition or quality of the vehicle. The Parties are of legal age and legally competent to enter into this agreement. The Parties agree to sign all documents necessary to transfer ownership of the vehicle from the Seller onto the name of the Buyer within 14 (FOURTEEN) days of execution of this agreement. The Buyer shall be liable for all costs relating to the registration of the vehicle and any and all other associated thereof. Ownership of the vehicle will only pass onto the Buyer once the payment to the Seller has cleared and the vehicle has been delivered to the Buyer. The Seller acknowledges that a deposit in the sum of _____________ was received on _____________ 20____. The Buyer agrees that the balance of the Purchase price in the sum of ________________ must be paid by ______________ 20____. The Parties agree that the deposit is non-refundable. Should the balance of the Purchase price not be paid by the date specified above, the deposit will be forfeited and both parties will be relieved of all claims and obligations with respect to this agreement. For maximum legal protection, obtain a lawyer reviewed Bill of Sale directly from us.